Crispy chicken tenders are usually something that have to be saved for a treat, but with my recipe you can tuck in any time you like! 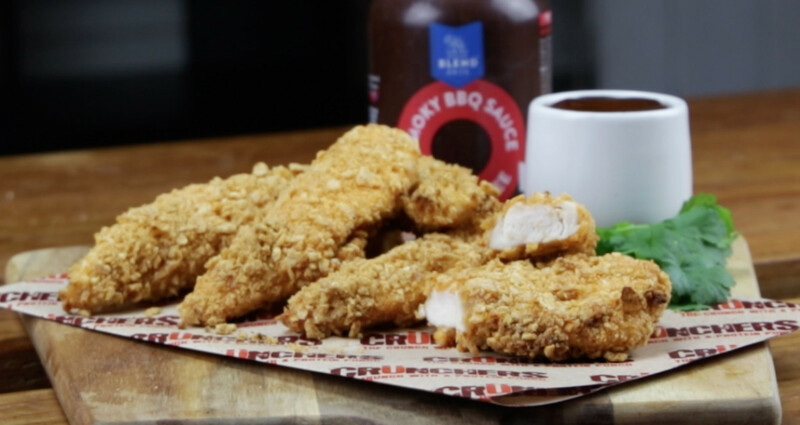 I've used UFIT's new BBQ flavoured high protein crisps as the coating, then dunked them into Blend Bro's incredibly authentic but entirely sugar free BBQ sauce - because everyone knows you can't have a chicken tender without drowning it in sauce, which is usually the most unhealthy part! This recipe is so incredibly simple even those who don't think they can cook (or kids!) can do! 2Blend the Smokehouse BBQ UFIT Crunchers in a food processor until fine. 3Tip the crushed Crunchers onto a plate & set aside. 4Whisk 1 large egg white on another plate & set this aside also. 5Dip the chicken mini fillet in the egg white then dip immediately into the crushed Crunchers. 6Place the coated mini fillets on a lined baking tray. 7Repeat with all the mini fillets. 8Bake for 20 minutes, or until golden brown. 9Allow to cool slightly, then dunk into plenty of Blend Bros Sugar Free BBQ Sauce!